Amazon (AMZN) stock climbed 10% after its first quarter report near the end of April, as the company marked its fourth profitable quarter in a row. The e-commerce behemoth benefited from increasing margins and growing market share. Its business model of investing all its gross profit back into the company instead of paying back shareholders has been controversial but that has not stopped investors from buying up shares in this company that has no problem sacrificing profitability for growth. Sanford Bernstein’s Carlos Kirjner has even given AMZN a price target of $1,000 earlier this week. That would be a 40% increase from AMZN‘s current share price. However that price target is not too farfetched 12 months down the road considering how the stock has sky rocketed recently, increasing 40% over the last quarter alone. Amazon is already trying to compete with Netflix by offering movies and television programs for those who have an Amazon Prime membership. But this new challenge to compete with YouTube might not work well for them. From a financial perspective it’s a smart move because Amazon already owns large amounts of servers for stream purposes, so Amazon Video Direct can provide the company with additional avenues of revenue growth with minimal investment. But since YouTube is already so big some people aren’t sure if Amazon can stand a chance against YouTube. 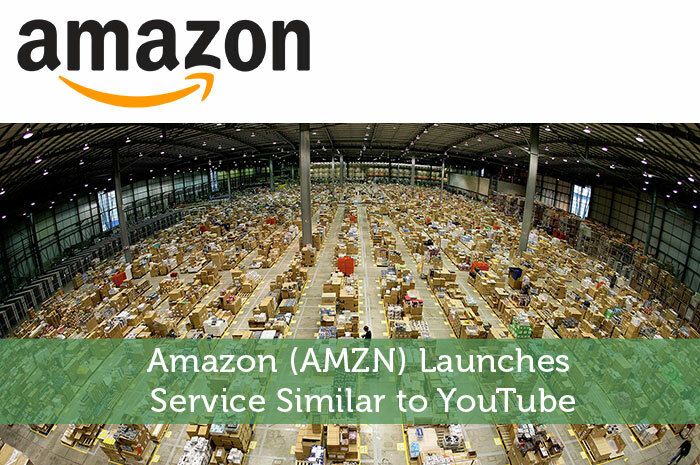 Amazon’s service works a lot like YouTube does. Basically the only criteria for content creators is that they have to upload HD video and the videos require close captioning capabilities. But the pay structure is a little different. The content creators who are uploading the videos can choose how they want their videos to be presented. For example they could make their videos free to everyone which means Amazon will place ads on their videos to generate revenue. Or uploaders can make their video available to rent or own. Or they can offer it through a subscription channel, or offer it behind Amazon Prime’s paywall service. Amazon can monetize these different methods and in turn, the people who upload these videos would receive monthly income based on how many minutes their media was watched. Amazon has already challenged Netflix, and is now taking aim at YouTube. The e-commerce corporation that started out selling books is now trying to get its hands on everything else. They’ve already succeeded in retail, clothing, and entertainment. But taking on YouTube may not be as simple as taking on Wal-Mart or Chapters. YouTube already has 1 billion viewers. Amazon is certainly entering into this game a little late. Many video creators already have successful channels set up on YouTube, so it is not likely they will leave a profitable platform. But on the other hand, if Amazon has an attractive enough pay structure they may be able to convince some of the disgruntled YouTubers who feel like they can’t expand their viewership or are not getting the best bang for their efforts. Hulu, Netflix, YouTube, and now Amazon all seem to be heavily invested in this market. According to the Pew Research Center, 15% of American adults have cut the cable cord as of December 2015. And 9% claimed they’ve never had cable or satellite to begin with. What this shows is that 25% of American adults do not have cable or satellite. The number is even larger among younger populations. 1 out of 3 American adults ages 18 to 29 do not have cable or satellite. So more and more people are either cutting the cord or are simply not signing up for traditional cable packages. There are some consumers who don’t even have television sets because they can just watch everything on their apps on their phones or on their computers. Is it a little too late for Amazon to get into the video sharing space, or is there still enough room for growth as more consumers choose to unplug from traditional cable packages and consume alternative media? I’m not sure. But both Amazon and YouTube believe that this is the right direction in consumer entertainment. I have a feeling this company will outperform the index over the next few years. Seems like a great move. I know people are more interested in video content as time passes, so creating a competitor for youtube is not a bad idea. We’ll have to see how this translates in winnings for their investors. In a world of slow economic growth, the internet seems to be one of the few places where it’s still growing.